Looks like we now know a whole lot more than we did previously! 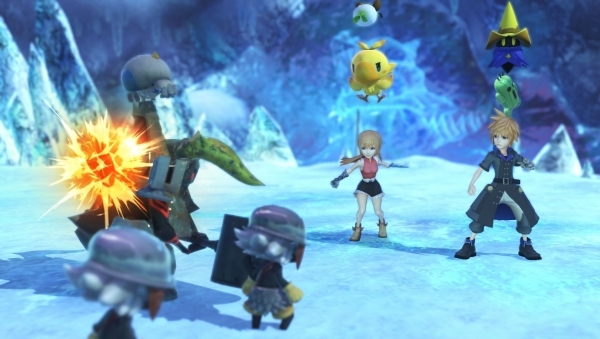 Previously when World of Final Fantasy was announced, as is usually the case with games at E3, we didn't have a lot of information to go on as far as what we'd be able to see out of the game. Producer Hiroki Chiba has now shared some additional facts about the upcoming adorable piece via GamesBeat that we can now mull over while waiting for the next game. For one, the game will use the familiar Active Time Battle system, though an altered version that Chiba says will "add something more like the current generation of games." 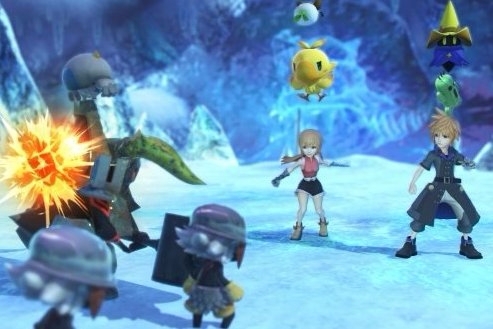 Also, the world of Final Fantasy in this title will pull from familiar scenes and locales from other games. Perhaps one of the most important new facts is the idea that you don't "defeat" monsters, but you befriend them after battle. You'll either capture or befriend them, and different monsters will be used for different situations. You can even ride on some of the monsters when you're smaller or stack them on top of your characters. There will be six characters/monsters in battle with your party consisting of the main campaign's twin characters and four monsters. Some monsters will be voiced, and there will even be a gaggle of new ones that have never been seen in the series before. Familiar faces will be there too of course, as well as other aspects from games we're already aware of. I'm looking forward to this particularly adorable entry in the Final Fantasy series. How about you?